Lately I’ve been feeling like maybe I’ve lost a step or two. The good news is that I'm now eligible to play in the Over 30 soccer leagues. The bad news is that lately, it's been feeling like the perfect league for me. I’m not quite ready for a mid-life crisis, but since returning to the states I’ve had a few moments that have made me want to start checking for gray hairs. Maybe the morbidity stems from the material on my bookshelf. The last two books I have read were both written by friends, while they were battling cancer. Last week I shared an excerpt from He Died All Day Long, a novel set during the Vietnam War. The author, Jon Wells, was the step father (“faux pa”) to one of my oldest and bestest friends. Sadly, Jon passed away last month, but he hung on long enough to hold a copy of his completed novel in his hand. I shared that piece of his novel because I thought it was an interesting angle on the feeling of “shipping out”—that feeling that I had a few years ago. Yesterday morning I turned the last page of Lopsided: How Having Breast Cancer Can Be Really Distracting, written by my family friend and courageous surviving babysitter, Meredith Norton. Whenever I think of Meredith, I will think of a fun, slightly-crazy young adult, willing to go toe-to-toe with my oldest brother in any and all arguments. As far as I can recall, she was the only babysitter to lean over and unlock the car door in an offer of assistance when my brother threatened to hop out and ditch our family outing. 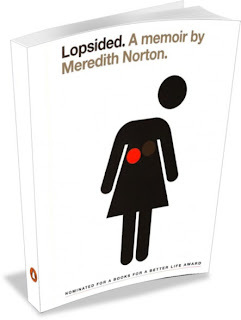 Meredith published her novel about five years back—and while I’m embarrassed to admit how long it took me to read it, I’m glad to say I finally did. Despite the subject matter, the book is never sad—in fact, it is pretty much hilarious. Like last week, I want to share a passage that reflects part of how I feel as my life transitions from one project/continent/chapter to the next. This time, the excerpt relates to my struggle to reintegrate into a totally different society and culture. "After months of communication deprivation in France I desperately wanted to join this dinner party conversation. I wanted to get the jokes and allusions, and make puns. So I let myself in, greeted everyone, and tried to say something worth hearing. But my brain, after twenty-four sleepless, exhausting hours traveling with a one-year-old, was incapable of anything better than 'It is being near twenty-one hour, is it not?' To which my father responded, 'Go to sleep. You're speaking English like a second language.'" Everyone’s knows about the different living standards and accommodations in the developing world. Those are the things that we expect to cause problems as we adjust from one life to another. However, the difference in shower temperatures or coffee-cup sizes has not been my biggest hurdle. From my observations, the biggest difference between people in the USA and people in Colombia or Cape Verde is not what we eat, wear, buy, or do. The single biggest difference is what we talk about when we’re talking about nothing. Small talk is a an art form that demands a tremendous cultural capacity and sensitivity, with the nuances of language ranging from stiffly formal to downright vulgar. The cultural context is also hard to grasp when you've been watching different channels and caring about completely different nonsense for the last few years. I’ve been pleased to find that I can still speak English with reasonable fluency, and I have yet to ask anyone to "guard" my coffee while I fish my keys out of my pocket. * Also, I’m doing my best to not start my sentences with, “Well, in Colombia...blahblahblahblah” That being said, I have to admit that my gift of gab has fallen off a bit. Reading that passage from Lopsided put my mind at ease a bit, secure in the knowledge that I am not the first re-integrator that has struggled to catch up with the conversation. Fortunately, you don't need to master the local language to have a good time or to be successful—just ask a Peace Corps Volunteer. For example, check out the signage at the Chinese food spot near UC Berkeley that's always doing good business. Or better yet, ask young Tyler Hallinan. Hanging out with Bumbalo & Sarah's almost two-year old son last night made me recall a few lines from Pilgrim at Tinker Creek (Annie DIllard, 1974). "There is a certain age at which a child looks at you in all earnestness and delivers a long, pleased speech in all the true inflections of spoken English, but with not one recognizable syllable. There is no way you can tell the child that if language had been a melody, he had mastered it and done well, but that since it was in fact a sense, he had botched it utterly." Don't worry, lil buddy... I hear you loud and clear. *In spanish the verb "guardar" can translate to hold," "hold/hang onto." Consequently, many gringos can be heard using the slightly inappropriate reverse translation when trying to speak English. So, the next time a Returned Peace Corps Volunteer asks you to "guard" something for them, just smile and nod—I promise you, they are not completely paranoid about someone stealing or attacking their half-eaten poppyseed muffin. NOTE: Meredith Norton passed away on August 2, 2013, less than two weeks after this post. Click here to read her obituary. caught me at a good time, thanks for this. hope all is well as you go into another transition soon homie. good luck with beginning school. much love from fiji.